We shouldn’t forget the abject cruelty of the “repeal” plans. Senate majority leader Mitch McConnell’s plan to force a vote on his health-care bill went foul from the start. The “Better Care Reconciliation Act,” devised in secret, turned out to be as harsh and as unpopular as its House counterpart. It stripped health insurance from 22 million people, raising most people’s premiums, particularly those of older and low-wage workers, and gutted Medicaid to pay for tax cuts for the very rich. There is no real mystery as to why this was a hard sell. 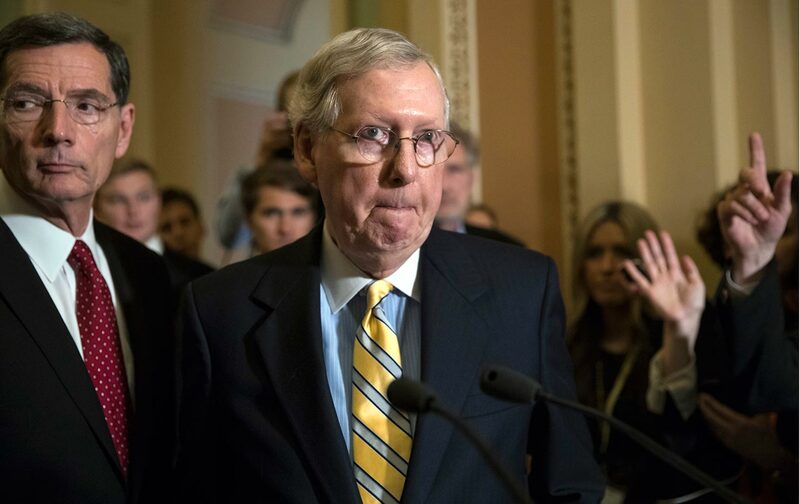 McConnell had to postpone the vote due to lack of support, but he hasn’t given up. The backroom wheeling and dealing, bribing and arm-twisting is ramping up, and McConnell may yet succeed, as Speaker Paul Ryan eventually did in the House. But regardless of the outcome, one thing should not be lost in the fray: This is what they believe. The Senate and House health-care bills are perfect expressions of the modern-day Republican project. Don’t be fooled by the focus on Republican dissenters. The Republican health-care bill in the House got 217 Republican yes votes; only 20 Republicans voted no. (No Democrat supported the bill.) Nine Republican senators publicly oppose McConnell’s bill, though several of them are against it because it’s not harsh enough. At the end of the day, a large majority of the caucus still supports McConnell’s plan to enact a large tax cut for the very wealthy, and pay for it by stripping Medicaid and health-insurance subsidies from millions of people. But outside the Senate chamber, the reverse is true. Most Americans oppose rolling back Medicaid. That is central to the Republican purpose, the essence of right-wing market fundamentalism. The Republican health-care debacle is a clarifying moment of truth. In Paul Ryan’s formulation, society is divided between the “makers” and the “takers.” The “takers” are those who benefit from public social programs like Social Security, Medicare, Medicaid, food stamps, college-tuition assistance, and so on. In Ryan’s world, these people are a drag on the “makers” who are taxed to pay for the programs. Our economy produces optimum results when each is free to pursue his or her own self-interest, under this theory. The Republican project is thus to free up markets by rolling back government social provisions and lowering taxes, particularly on the rich. The reality, of course, is that the rich and powerful use state power to rig the economy for their own benefit, including massive subsidies exacted by entrenched interests. Cutting subsidies, by definition, makes health insurance more costly. So Republicans seek to pare back or eliminate coverage mandates—limiting coverage of preexisting conditions or reducing essential health-benefits requirements. If successful, rates won’t soar as much. Working-class and older workers will find affordable plans with high deductibles that won’t help them much if they get sick. Given this nefarious purpose, and the need to limit the political price of very unpopular reforms, deception and lying are essential parts of the Republican project. So McConnell claimed his purpose is to “strengthen Medicaid.” Senator John Cornyn promises that Republican reforms would “save the people who are currently being hurt.” Trump’s buffoonish boasts—that they’ll come up with “something terrific”—make the lies more transparent, but not more persuasive. Similarly, Republicans have little choice but to try to discredit expert analysis. They have attacked the nonpartisan Congressional Budget Office, headed by a Republican appointee. Right-wing think tanks have deployed experts to advance the usual talking points: Government and government waste must be denigrated to help convince voters that the market will offer far more for less. Donald Trump anointed Republicans the party of the forgotten (white) “American worker.” But the white working class takes the hardest hit from the Republican project. More whites than blacks or Latinos benefit from Medicaid. And Medicaid’s coverage of those in nursing homes, disabled adults, or children with special needs provides vital protection not only for them but also for the workers and families that would otherwise be overwhelmed by the costs. The Republican “repeal and replace” bills expose the cold hard truth about the Republican project. If McConnell does succeed in cobbling together a Republican majority in the Senate, and Trump signs a bill into law, Democrats should make the GOP assault on Medicaid central to the 2018 election. The Republican debacle in trying to repeal and replace Obamacare opens the way for a renewed debate about securing the right to affordable health care. Whatever happens, let’s remember this clarifying moment: Republicans don’t care about your health care. Their goal is simply to enrich the wealthiest Americans.